WELDON SPRING, MO — Exterminators took extreme measures to remove thousands of poisonous spiders from a Missouri home. Crews covered a house in what looks like a giant circus tent. They then pumped in poisonous gas. The family that bought the house six-years ago had enough of poisonous spiders. It didn’t take the family too long to realize the home was infested with the venomous brown recluse spiders. A spider expert figured up to 5,000 were living in the house. The current owner sued the previous owners, saying they never told them about the spider problem. The home eventually went into foreclosure. A leading brown recluse expert said the spider’s bite can be serious depending on how much venom is injected. Today’s culture is so obsessed with the occult but they don’t have a real clear understanding of what the occult is. The occult is being advertised as something cool through television , songs and social media but what a lot of people don’t know is they can become possessed by an evil spirit(s) by dealing with the occult . Did you know by going to a fortune teller you are giving demons a wide door in your life . Fortune tellers work with the devil to get the information that people ask for . Their is a television show on TLC named Long Island Medium which is a show about a woman who is a medium who communicates with the deceased . Leviticus 19:31 says not to go to any mediums or magicians . A lot of people don’t realize that The Bible is more current than the news it has answers to most of the worlds questions . God tells us not to do things for a reason so when he said that in Leviticus 19:31 he wasn’t saying that just to be saying something he was serious ! When it comes to stuff like that God has a 👉low tolerance 👈 for it ( I’m not saying that he accepts everything else . ) . Exodus 22:18 says don’t allow a sorcery to live . This doesn’t mean you should go around killing any witches . In this past year alone I have seen so many demon possession movie trailers that it’s ridiculous . Naturally people are curious about the supernatural but it’s very important that people don’t get into the wrong side of the supernatural (the occult ). Everybody wants to call themselves a pastor , preacher , prophetesses , youth minister , etc. but the truth is everybody has not been called into ministry . God tells us in 2 Peter 2 1-3 that false prophets are among the people . Just because someone screams to the top of their lungs during a sermon or speak in tongues doesn’t mean that they are called to preach . 1 John 4:1 says test the spirits to see if they are from God . God knew that their would be a lot of false teachers out their claiming to be legit but he warned us millions of years age of this . 2 Peter 2 1-3 warns that people will follow false teachings and choose that over the truth . Doesn’t that sound familiar ? Their are even secular stations that show a lot of “preachers ” because their messages are so watered down you can’t tell whether it’s Christianity ,a pep talk or a motivational speaker . Today’s culture as a whole don’t take Christianity serious at all . Christians have gotten such a bad reputation because a lot of Christians are living just non believers . I’m not saying that you are going to be perfect but once you become a Christian their are some things that you aren’t going to do anymore because you are supposed to be transformed (Romans 12:2). Romans 12:2 says we shouldn’t copy the behaviors of this world but we should be transformed in our thinking. People don’t understand that the battlefield takes place in the mind . The reason a lot of people do certain things is because of their mind . If you are doing or thinking about something that is against God then you know it is of the devil . Their is a quote that I saw on Instagram that I love it says ,”You can’t be a part time Christian and expect a full time God .” That makes perfect sense but slot of people do that . That’s like working a part time job and expecting a full time paycheck . 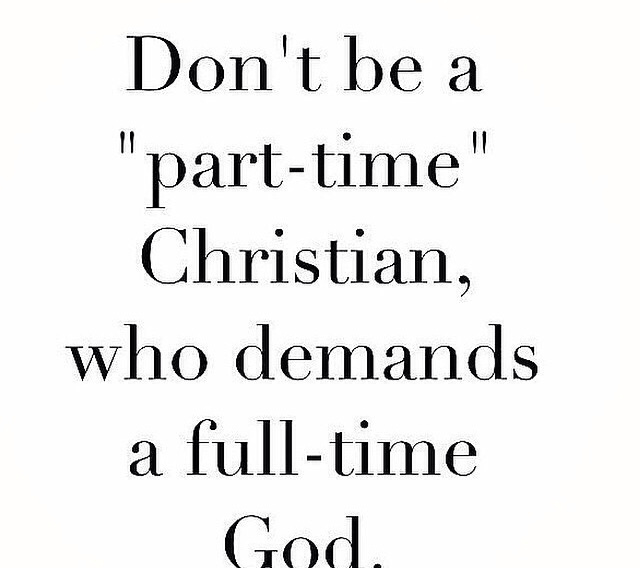 God doesn’t like part time Christians because he is not a part time God . Remember that God is not only protecting us from seen dangers buy other is also protecting us from the unseen . No one said that you didn’t have to have a life but give God your all because he gives us his all . Right now as I type this out there is an agenda being written to remove Christianity from America. Well, it’s not being written its already been published. This agenda has been in the making for the last 50 years but currently, it has been in the works stronger than ever. In California, there is a situation going on right now about schools getting rid of all books that have anything to do with Christianity. Of course, you aren’t going to hear about that on NBC, ABC, MSNBC, etc. because all of those stations are owned by people who hate Christianity. I did a post about one of the former owners of NBC saying,” We don’t tell the people what they need to know we will tell them what they want to hear. ” Doesn’t that explain why there is barely news coverage of Christian persecution because they don’t want you to know. We are living in the information age but there are millions of people who have as much information as they did in the dark ages. If you think that there isn’t an attack on Christianity you are deceived. A lot of people often ask,” Why can’t Christians and nonbelievers get alone? ” The reason behind that is because Satan hates Christians and he doesn’t want anyone to get along with us so he causes hate and violence between Christians and nonbelievers. This is why it’s so important for ALL Christians( regardless of race) to stop arguing over silly theology differences. All Christians need to come together and fight the good fight of faith. As I type this out now there is a girl from New Jersey ( I saw the article on Christian Post but I lost the page somehow.) who is going to court to fight to keep in God in the alliance for herself. I applaud the girl and that goes to God can use whoever he wants to do his mission. The problem I have with this situation is you have people who are twice her age that is afraid to stand for human secularism. This situation sort of reminds me of 2 Kings 6:15-17. The prophet told his assistant not to be afraid because the angels that were on their side were much bigger than the enemy( The people they were fighting were the Syrians.). Like Elisha’s assistant, a lot of us are looking in the natural side when we should beneficiary on the supernatural. I’m going to end this post with this Bible verse (1 John 4:4). He (God )that is in you is greater than the spirit of the world (Satan ). The next time you are dealing with something keep in mind that you are fighting against evil spirits and principalities, not people. A lot of times the people that give us problems are inspired by those evil spirits and principalities. If you believe that Christ died on the cross for our sins and rose on the third day then you have the power to fight those evil spirits and principalities. Nowadays when it comes to kingdom building their are different tools used to build Gods kingdoms but all of the tools used should be biblically inspired . God knows what tools are needed to stir up each different generation . This generation is the most technical generation the world has ever seen and it’s not a coincidence that so many people have been reached by the gospel on the internet . Acts 2:17 says ,”In the last days,’ God says, ‘I will pour out my Spirit upon all people. Your sons and daughters will prophesy. Your young men will see visions, and your old men will dream dreams.” God tells us in Acts 2:18 that his spirit will be poured out on some of everyone . God has a history of taking nobodies and making them into some bodies. The people that you never could have imagined God using will be the ones that get picked by God to grow his kingdom. 2 Corinthians 12:9 says ,”But he said to me, “My grace is sufficient for you, for 👉my power is made perfect in weakness👈.” Therefore I will boast all the more gladly about my weaknesses, so that Christ’s power may rest on me.” While the human eye is so busy looking at the weakness of someone God is looking at their strengths . Let’s take Moses for an example he stuttered , in the natural he is the least likely person to get chosen to expand God’s kingdom but God saw something that was not visible to the naked eye. We are living in the last days and God is using things that attract people(Technology,Music,Movies,etc.) to pull then towards him. God is an expert of being a fisher of men. Satan also draws people towards his ways so it’s very important to know the difference ☝️. God wants us as Christians to be fisher of men and in order to do that you have to have a great relationship with God so you can listen to what he is telling you . In these wicked days we need to try to win as many people over to Christ as possible because Jesus can come back at any time and we need to be rapture ready ! Mark 16:15 says to preach the gospel over the entire earth . A lot of times people go to other countries and that’s good but don’t forget about America ,we still have nonbelievers here too. When it comes to Christianity people have gotten it mixed up with the what can God bless me with theology . When instead we should be asking what can we do for God . In order for Christians to build their kingdom we must keep Jesus as the main message . A lot of times some Christians misinform people by making them believe that when they become a Christian they will never go through hard times again . Every Christian that is trading this knows that is not true . Christians go through hard times just like everyone else but the difference is we serve someone who helps us through those situations . We live in a world where their is so much hurt and a lot of people don’t know the solution to their problems👉Jesus👈 . Their isn’t a problem that you have that Jesus has not seen. Jesus is the chief psychologist he has a solution to every problem so the next time you’re going through something please keep that in mind . Hello and welcome to Information-Hub📖📚✏️📜 ! I hope you have looked at previous posts I have done and if not please take the time to do so 😃 that will be greatly appreciated 👍. Today I want to talk about God and what he left on record for us to do . Over time people have got this thought that they can do whatever they want because of grace but that’s not true ☝️. Ephesians 2:8 declares: God saved you by his grace when you believed. And you can’t take credit for this; it is a gift from God. If someone gave you a gift card, with a set amount of money on it, would you keep using it like it was unlimited ?? I’m sure you wouldn’t because pretty soon it would get declined. We should be the same way about grace. Let’s not use it just because it’s there but because we need it when we have messed up. Everyone sins and God knows that but he also knows when we sin just because we want to live in the flesh. Hebrews 4:13 declares that Nothing in all creation is hidden from God. Everything is naked and exposed before his eyes, and he is the one to whom we are accountable. That verse explains itself because it is very self-explanatory. If you’re a person who believes they can hide their inner true thoughts and desires from God then you are sadly mistaking. A lot of times humans can discern when something isn’t right about a person if they use their gift of discernment. Since we are living in the final days times are already going to be wicked. Matthew 24:37 says,”When the Son of Man returns, it will be like it was in Noah’s day. This doesn’t mean that we as Christians sharing the gospel or living the way Christ wants us to live this should make us want to live for Jesus even bigger only because it shows loyalty but because people are watching. I’m not sure if you realize it or not but when you are out people watch you especially if you profess to be a Christian. It doesn’t matter if you speak tongues eight times a day if you aren’t living a lifestyle that supports The a Bible you are just playing church and you have a pretend spirit. That bible verse is perfect for people who like to be seen in their earthly deeds! Sit down and wait for God to bless you and once you do get blessed don’t be boastful about it. Some might be thinking,”What if God doesn’t bless me for doing something good ?” God is VERY smart and he knows the difference between when you do something for good or because you want to be seen. You might be thinking,”Well I have done a lot of great things over the years and I still haven’t been blessed. ” God protects us from unseen and seen dangers so your blessings could have protected you from an unseen danger and you don’t even know it. This reminds me of a story about a young lady who was running late one morning and she was so mad. She set her alarm to go off at its regular time but it went off later than expected. As she drove to work she discovered that the way she usually takes to work was blocked off because of an accident. That late “inconvenient “alarm saved her life because if she would have left at her scheduled time she would’ve been killed by the drunk driver that had injured someone else. I’m sure she thought from time to time that she wasn’t blessed but little did she know that her blessings had already been applied to that situation! People question God like he doesn’t know what he is doing but trust me he knows what he is doing he isn’t an amateur. read their bibles they are listening to every preacher they see on television . Don’t get me wrong their are some really great (Please view my previous post too see which televangelist I recommend .) but not every “preacher ” that say that God called then are not talking about the God of Abraham ,Isaac and Jacob they are talking about the God of this world (2 Corinthians 4:4,NLT) which is Satan . When I say God of this world I don’t mean he owns the world but he is the leader of wordly things (Smoking ,Drinking ,Fornication ,etc.). I have said it before and I will say it again if the message that your preacher does not match up with the word of God then you need to leave that church because they are preaching a gospel different than the one found in The Bible. It’s all about priorities and we should all have God as our number one priority . Romans 5:8 says :But God showed his great love for us by sending Christ to die for us while we were still sinners. God loved everyone but not their lifestyle and that’s a huge difference . A lot of pastors nowadays will tell you that God loves you just the way you are 👉MAJOR LIE🔥🔥👈. God does love you but he loves you too much to leave you like you are . The reason some people don’t see anything wrong with their lifestyle is because they are ignoring the conviction from the Holy Spirit . You know that God doesn’t approve of your lifestyle ,whether it’s secret(Their are no secrets to God,God sees all👀 and he hears👂 EVERYTHING )or not . Hebrews 4:13 says that : Nothing in all creation is hidden from God. Everything is naked and exposed before his eyes, and he is the one to whom we are accountable. Their goes the verse right their so now you know that I’m not bring dramatic . By the way if you ever have a question or disagreement about anything on my site post the question 📌📋and I will answer it as soon as possible . In closing I just want to say that their is only one way to heaven and that is though Jesus Christ ! John 14:6 says :Jesus said to him, “I am the way, and the truth, and the life. No one comes to the Father except through me. If you are worshipping anyone besides Jesus then you are worshipping an idol God ! It’s that simple ! Mary does not have a heaven or hell to put you in but God does ! **Please View my previous posts about Mary and her accepting Jesus and how worshipping her is considered idol worship . I hope you have enjoyed this post and please rate this post👍👎 , subscribe to this blog 📩,like this post and others and comment on it 💬! Thanks for taking the time to read this and God bless you .